WASHINGTON — An overwhelming majority of the American public, including half of Republicans, support government action to curb global warming, according to a poll conducted by The New York Times, Stanford University and the nonpartisan environmental research group Resources for the Future. Global Warming: What Should Be Done? 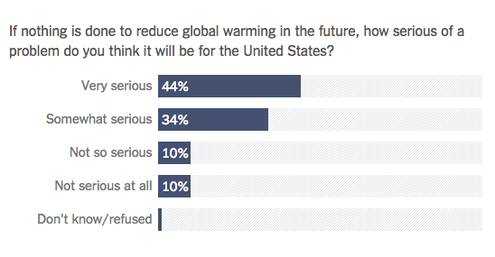 This nationwide survey asked people for their views on whether global warming will be beneficial or detrimental, about how the president and Congress have responded to it, and what they believe government should do about it. The support was greatest among Democrats and independents. Ninety-one percent of Democrats, 78 percent of independents and 51 percent of Republicans said the government should be fighting climate change.